LBUSD will present Seussical the Musical this weekend, a musical extravaganza featuring Horton the Elephant, the Cat in the Hat and other favorite Dr. Seuss characters. Performances will be held at 4 p.m. and 6:30 p.m. on Friday and Saturday, June 8 and 9 in the TMS Black Box. Tickets are $5 for students and $10 for adults, and available at www.lbhs.booktix.com. Michael Irish, LBHS & TMS Drama guest teacher and most recently fight choreographer for Night of the Living Dead, will return to direct next year’s LBHS fall play, William Shakespeare’s Romeo and Juliet. Michael will lead a Shakespeare workshop on Saturday, June 9 from 10 a.m.- 1 p.m. in the LBHS Dance Studio. This workshop will be open to all LBHS Drama students as well as this year’s TMS 8 Grade Drama/Chorus students (incoming freshmen). Additionally, Summer Drama camps registration is open. The optional camps will meet Monday - Thursday, August 20 - 23 in the Greene Room, LBHS Room 55. Instruction and activities will focus on audition preparation and techniques for drama and musical theatre. Drama students are also encouraged to attend Dance Camp. A supervised lunch break will be provided for middle school students attending both camps. Registration fees are $200 per discipline or $400 for both. Registration is currently open at www.lbhs.booktix.com. Some other important events include the LBHS Drama/Theatre II playwriting and directing showcase set to take place on Monday, June 11 and Wednesday, June 13 at 3:30 p.m. in the LBHS Greene Room. The TMS seventh grade drama/chorus reading, the Bully plays, is set to take place on Thursday, June 14 at 3:30 p.m. in the TMS Black Box. Also, LBHS drama end of the year event is taking place on Saturday, June 15 at 4 p.m. in the LBHS Senior Quad. “The Laguna Beach Unified School District has made a dedicated commitment to the implementation of a comprehensive social and emotional support (SES) system for all students K-12 because we recognize the paramount role it plays in a positive school climate,” said Superintendent of Schools Dr. Jason Viloria. “We strive to support every student, every day, and we appreciate the support and guidance the ADL has provided as we move forward with this mission,” he concluded. For information on the LBUSD, go to www.lbusd.org. The Laguna Beach Unified School District Board of Education will hold a special Board meeting on Tuesday, June 19 at 6 p.m. in the LBHS Library to review survey data regarding the 2019-2020 instructional calendar. LBUSD partnered with Hanover Research, a private research firm located in Washington D.C., to administer an opinion survey of students, parents, teachers, and staff regarding recommended changes to the District’s academic calendar. The calendar survey data review is an information only item. No action will be considered at the board meeting. The Board will provide the district staff with direction on the next steps in the process. For additional information, including the recommended 2019-2020 calendar, visit www.lbusd.org/calendarplanning. El Morro Elementary School was named to the 2017-2018 Educational Results Partnership Honor Roll for its high achievement and student success. The 2017-2018 Honor Roll is developed by the Educational Results Partnership (ERP), a nonprofit organization that applies data science to help improve student outcomes and career readiness. ERP maintains the nation’s largest database on student achievement and utilizes this data to identify higher-performing schools and districts. Schools that receive the ERP Honor Roll distinction have demonstrated consistently high levels of student academic achievement, improvement in achievement levels over time, and a reduction in achievement gaps among student populations. Despite the many events that took place this last weekend, LBHS’s community day, offering Breakfast with the Breakers, proved a great success. The day included interactive activities, live performances, and much more. From 9 a.m. - 1 p.m., athletic physicals were available for those wanting to play sports for the school (physicals are required), with fees going to help fund the LBHS Athletic Training room. There were also optional Cardiac Screening tests for anyone interested. Along with the Pancake Breakfast, booths with sports information and youth experiences for elementary kids were available, offering arts and school club information. The LBHS Walking for Water Club held a “walk for water” event on Sunday, June 3 at the Laguna Beach High School Track from 12 - 3 p.m. Last year’s walk brought in enough donations to fund the digging of two wells, one in Burkino Faso and one in East Africa. The goal this year is to fund three wells in total – including one in Nepal, in a partnership with Rosalind Russell’s R Star Foundation. Walking for Water supports the nonprofit Wisdom Spring in the effort to build wells in rural Africa. The walk symbolizes the daily struggle of women and children around the world, as they walk miles each day to access clean water. For more information, visit www.wisdomspring.org. The LB Water Polo 14U “A” team girls just finished the Southern Pacific Zone Junior Olympics Qualifier in first place. This gives them the #1 seed for the 14U girls in the Junior Olympics National Championships this July at Stanford. Congratulations from Stu News and good luck! It was a mystery that Thurston Middle School’s Forensic Crime Team investigated since discovering the gruesome “murders” of three people in Dana Point Harbor last March. Er, make that Roanoke Island, and the year was 1585. The Forensic Team club was started by social studies teacher, Michelle Martinez, and is open for all 6 - 8th graders. For the past three years, Cox Communications has provided support for the program, through their Innovation in Education grant. Martinez designed the program to teach students how to analyze and apply critical thinking to real-life problem solving. Sir Walter Raleigh had been charged with establishing a colony in the New World, by her majesty Queen Elizabeth I. He provided the colonists with one year’s worth of essential supplies, while he returned to England. After three years he returned to find the entire colony of 115 people had disappeared. In the Crime Team’s scenario, John White was travelling with Sir Walter Raleigh, and he was devastated on his return to find his entire family was gone along with the colonists. He blamed Raleigh for their demise. Prosecution Attorney Keegan Thomas points out just how unfortunate it is that Gilbert looked so much like Raleigh! The team “prosecutor” presented evidence that John White had murdered the victim, Sir Humphrey Gilbert, Raleigh’s brother, aboard their ship in a case of mistaken identity. They did have eerily similar mustaches! Medical Examiner, Gabby Finkelstein, presented the biological report on the three bodies found: Below deck, it was determined that Paul Martin had been suffocated by a pillow – he was purple around the eyes and had small feathers in his mouth and lungs; the dead man found beneath the water was the ship’s night watchman, Victor Smithfield, who had drowned, with evidence of blunt force trauma to the head; Sir Humphrey Gilbert had been stabbed twice in the back and once in the neck. There were several witnesses. The Spanish “Captain” Joaquin Andres was ashore and saw some shadows on the deck of the Royal Ark. Captain Andres’ testimony, in Spanish, was niftily translated by Interpreter Austin Plank in the courtroom. The French “Captain”, interpreted by Margaux Huot-Marchand, saw a Native American on the deck, maybe Manteo, the Croatan tribal leader, whose tomahawk was found at the scene. Manteo was presented to the court, played by Quinn Butler, and stated that he was a tracker who had come to the ship to report that they’d found no clues as to the disappearance of the colonists – but then he discovered the dead man. “My tomahawk was dropped when I was alarmed,” he said. After DNA and ballistics evidence pointed toward John White, the Defense Attorney, played by Cassidy Morgan, had a tough time. She protested, saying there were just too many other fingerprints to prove his guilt. Besides, he is a Quaker, a man of God and doesn’t believe in killing. The Prosecution Attorney, played by eighth-grader Keegan Thomas, ultimately brought forth enough damning evidence and posited reasons that the jury sided with – John White killed the two guards quietly because they had witnessed his brutal murder of Sir Humphrey Gilbert. Gilbert had been savagely killed, shot and stabbed, to inflict the most pain, in an act of revenge for the loss of his family. The jury convened and talked it out before the audience in Thurston’s Black Box theatre. Whodunnit? They concluded John White done it – guilty by reason of insanity. He was sentenced to exile from the colony. 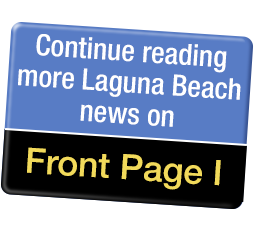 Members of the public are invited to attend a free instrumental music performance by Laguna Beach High School student musicians at 7 p.m. tonight, Tuesday, June 5 in the LBHS Artists’ Theatre, 625 Park Avenue. The LBHS Spring Instrumental Music Concert will feature wind and string ensembles directed by Jeremy Chung, the jazz orchestra directed by Steven Wade, a special piece performed by our award-winning Drum Line, and more! Enjoy the music while supporting the arts and youth in our community.